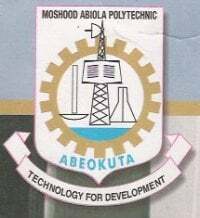 This is to inform all the candidates were not able to participate in the Moshood Abiola Polytechnic (MAPOLY), Abeokuta 2013/2014 academic year 2nd batch post UTME screening exercise that was conducted on the 18th and 19th of October 2013 due to insufficient computers that the authorities of the institution has set a new date for them. Prospective students of MAPOLY who have not written their post UTME screening are therefore reminded that the second batch screening comes Tuesday, October 22nd, 2013. Don’t miss it!